In the ancient fortress town of Semur in Burgundy, strange unnerving events are taking place, and an invisible multitude has gathered outside the gates: the spirits of the dead are returning to Semur. Eventually these spirits take over the city, and push the town's populace outside the gates. The townspeople are cold, hungry, and homeless, wondering whether they will ever go home again. This ghost story is told by five witnesses, each telling a piece of the story, while revealing his or her own attitudes and beliefs. The story begins and ends with the mayor's narrative, a politician with a firm belief that he is the modern man, above religion, above women. He reports the story factually, but his prejudices and limitations won't allow him to understand fully what has happened and why. On the other end of the spectrum are the narratives of the mystic Paul Lecamus, who has the closest contact with the spirits, and of the mayor's wife Agnes whose spiritual nature allows her to see and understand more than most people. Each witness's narrative moves the story forward. This novella is one of Margaret Oliphant's most popular stories of the Seen and Unseen. Mrs Oliphant herself believed that there is an Unseen world all around us. The Dupins' longing for little Marie no doubt reflects Mrs Oliphant's own longing for her daughter Maggie, who died suddenly of fever at age 10, in Rome in 1864. The town in this story refers to the ancient walled city of Semur-en-Auxois in the Cote d'Or, Burgundy. 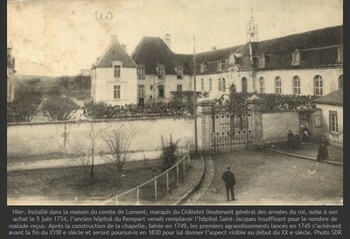 Margaret Oliphant and her younger son Cecco visited it in 1872, after she had completed a stay in the French countryside while working on the biography of the late Count de Montalembert. While in the town, she may well have visited Semur's hospital for the poor, located on the ramparts of the town (see photo above). As in this story, there was a ward on each side of the chapel, with open doorways so that patients would hear the services from their beds. In the story there are many characters who are contemptuous of religion. This common attitude in nineteenth century France was a legacy of the French Revolution. As part of the Revolution's movement of "la déchristianisation", not only was government made completely secular, but there was an effort to dechristianise France on a social level: society was encouraged to see religion as nothing more than superstitition. After many churches were defaced and/or closed, Robespierre and the Convention disbanded the movement of déchristianisation in 1794, but the damage to society was already done.